Here is a fun twist on regular mashed potatoes. I love pesto and goes very well with potatoes. Add rinsed potatoes to a large pot and cover with water until just submerged. Bring to a boil over high heat. Then reduce to medium-high heat to achieve a low boil. Cook uncovered for 15-20 minutes or until tender and a knife easily slides in and out. In the meantime, prepare pesto by adding basil, garlic, nuts, lemon juice, and nutritional yeast to a food processor and blending to combine. Stream in 2-3 Tbsp olive oil a little at at time until a thick paste is formed. If trying to reduce fat, thin the sauce with water instead of additional oil. I like adding a little water to mine to make it more of a pourable sauce, but this is optional. Taste and adjust flavor as needed, adding more lemon juice for acidity, nutritional yeast for cheesy flavor, salt and pepper for overall flavor, or garlic for zing/bite. Transfer to a small serving dish and set aside. Preheat oven to 450 degrees F (232 C) and line a baking sheet with parchment paper. When the potatoes are soft and tender, place on the baking sheet and smash down with the bottom of a saucepan. For any larger potatoes, cut in half and then smash so they are still "bite size." Drizzle the potatoes with 1 1/2 Tbsp oil and season with a healthy pinch each salt and pepper. Roast for 20-25 minutes or until crispy and golden brown. 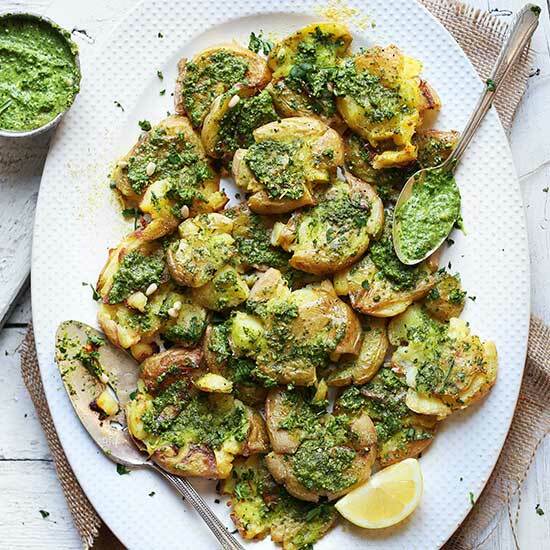 To serve, spoon the pesto over the potatoes (you will have leftovers). Garnish with chopped basil or parsley and additional pine nuts (optional). Best when fresh. Store leftovers separately in the refrigerator. Potatoes will keep for 3-4 days. Pesto will keep for about 1 week (see notes for uses for leftovers). Reheat in a 350-degree oven until hot, then top with any leftover pesto.